Ask me any questions you might have. I take it we are mercs? Would you please set up a topic for our characters to post bios? Then we can try and figure out how we know each other. I am not familiar with the SW timeline, is your date of 2BBY. Can you elaborate a little so that I have an understanding? Thank you ma'am! Rekara is naturally one of those beings who seem to naturally avoid being noticed, as he has the habit of sitting still and listening so that those around him forget he is there; a side benefit of scout training. He has always been an idealistic Mon Cal, and though he knows better he still seeks the best in beings, and though he is often disappointed he is occasionally rewarded. He has an inquisitive nature, and is not afraid to pursue things that he finds intriguing. Risks are calculated against the potential rewards, and he follows the creed, “Who dares wins”. He is creative and quiet, enjoying human classical music when possible and hums along, He doesn’t often speak, unless he has something to say, preferring to let others speak their minds. Rekara has a good heart and generous nature, and is possessed of a sense of honor. Like many Mon Cal, he has a poor opinion of Quarran and considers them beyond redemption. Family- Uncle Oro on Mantan. All others deceased in 22 BBY from Quarran battle droid attacks during Battle of Mon Calamari. History – Rekara was born on the planet Dac in 37 BBY, which is the homeworld of the Mon Calamari. His family were primarily academics who placed a high value on a good education, thus Rekara benefited from a high caliber education from early youth on. When he was nine years old, the Katana Fleet disappeared mysteriously, an event which interested the young Rekara and drove his future forward into Scouting. Wanting to learn of the mysteries of the Galaxy, Rekara studied hard and eventually earned his graduate degree from the University of Foamwater City. The best path to explore the ways of the universe seemed to be in the Scouting profession rather than in the halls of academe, and he yearned to go exploring. 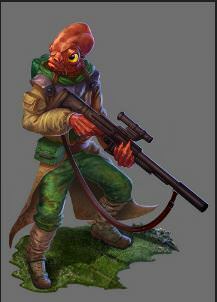 To prepare himself for his path to the stars, Rekara joined the local Mon Cal military for training as a scout pilot and quickly gained recognition, in addition, for his keen perception and ability to infiltrate secured areas. His skills were put to good use in securing information on Quarran activities, while the situation grew more tense between the planets inhabitants. With his information on visual activities, the Mon Cal were able to contact the Jedi with activity reports. Then in 22 BBY, the situation between the Mon Cal and the more populous Quarran came to a head, when the Quarran Isolation League struck the cities of the Mon Cal with the help of the Confederation of Independent Systems (CIS) and their battle droids. During the first city assaults by the ruthless droids, Rekara’s entire family was killed, a fact that Rekara didn’t learn until later. The Jedi sent an assault fleet under Jedi Master Kit Fisto to assist the Mon Cal and restore the planet to order and peace. With the arrival of Jedi-led reinforcements, the tide turned against the Quarran, and Rekara briefed the Jedi Master and his Head Quarters on intelligence he had gathered from his scouting missions into Quarran territory. This helped Jedi Master Fisto in his battles against the Quarran and the Moappa. With the Moappa neutralized and the Quarran eventually subdued, peace was restored, at which time Rakara learned of the death of his family. His only surviving family member was his Uncle Oro on the Mon Calamari colony world of Mantan, where he served as a design engineer for spacecraft. One of the Jedi accompanying Master Fisto, Master Shulamith Rah, learned of the fate of their Mon Cal scout’s tragedy, and offered Rekara support in his time of loss. The young Mon Cal was grateful for the support of the Jedi in saving his world from the Quarran revolt, and listened to the advice of his new friend Shulamith Rah to overcome his grief. Having learned of the useful skills of the local scout on Dac, the Jedi quietly arranged for Rekara to be employed through a series of third parties and given assignments which honed his skills in scouting and piloting. His new friend, Jedi Master Shulamith Rah “kept in touch” with Rekara as he went about his career, and their friendship deepened with repeated contacts. The maturing Mon Cal had grown to know the selfless service of the Jedi to the Republic, and they thus held a positive image for the scout. By the year 19 BBY, Rekara had not only mastered the art of scouting, but had begun a career as an Ace Pilot, serving in many capacities to pilot others on business in the Galaxy. During this time he learned Bocce, and served for an extended period with a Wookie co-pilot, and learned the language and customs to an expert degree as a measure of respect for his compatriot. He had also managed to amass a small supply of trading goods from all over the Galaxy, which he used to sell on various planets to keep his income supplemented, and it gave him cover for his scouting activities. Over the years, Rekara picked up occasional work on various short term contracts for vessel transit runs or ship ferrying missions, which broadened his list of contacts. In addition, he frequently contracted with a bounty hunter and/or mercenary group known as the Blackbirds, commanded by ARC-88 "Backblast", their CO and leader. His latest contract job as a pilot for Rhoza Feldan expired and he was paid off on Coruscant. Finding himself temporarily out of work, Rekara made his way to a space port bar to run his contact list, drink and look for work. lanyard; Hold Out Blaster (Licensed) with concealed holster; Cargo Pants, Long-Sleeved Tunic, Sleeveless Jacket, Garrison Belt, Boots; Padded Flight Suit; Utility Belt; Encrypted Comm Link; Survival Field Kit; 5 ration packs; Glow rod; Energy Cells (10); Power Packs (3); Bandoleer; Personal kit and clothing. Used Aratech 74-Z Speeder Bike (Licensed) in good condition. 1. Uncle Oro - Mon Calamari starship designer on Mantan. I need some assistance on the timeline, as I don't think this sim matches up with the old Triple Zero sim. How can we know each other folks? I'll get my sheet up later. Some basic information on my character, I'm definitely going to be fitting into the Bruiser archetype, being mostly skilled in combat, with some computers acumen and face skills. * Caden: Outspoken and cheerful, has a tendency to run his mouth at the worst possible time. While not generally mean-spirited, he doesn't care much about anyone other than his sister and the rest of the crew. * Raisa: The opposite of her brother, both quiet and aggressive. Believes in letting her actions speak for her. Both siblings are virtually identical in appearance, including facial features, build, height, clothing, and voice. Through long practice each is capable of mimicking the other's mannerisms and speech patterns, to the point of fooling nearly anyone who doesn't know them. For the benefit of the crew of the Eliza Battle, Caden wears his hair loose, while Raisa keeps hers tied back. Personal History: Born on a sparsely inhabited colony world, the Duenn twins were made orphans in 19 BBY when the Clone Wars reached their world, which was nicely positioned along a crucial Separatist supply line and was subsequently fought over for months, resulting in large swathes of the main continent being bombarded from orbit by both sides. Caden and Raisa reached Coruscant in a batch of refugees, and were mere hours away from being shipped out to separate camps on other worlds when the droid armies attacked. In the confusion, they two slipped away into the lower levels, and there struck out to survive on their own in the shadow of the new Galactic Empire. Cut forward seventeen years, and the twins have found their callings in life. Caden is a talented mechanic, able to fix nearly anything he sets his mind to. Raisa developed into a stone-cold assassin specializing in breaking into highly secure areas. Both are skilled in hand to hand combat (though Raisa far outshines her brother), a tribute to their species' heritage. 1. Rekara; the twins contracted him on two separate occasions for transport before the crew assembled. 2. Cyrenia Jakita; met in a face-off over a debt between a client and the Black Suns; since then have worked a few high-profile contract hits together. Raisa in particular respects the "old soldier lady". 1. Morrin; part time arms dealer that the twins exclusively obtain their gear through at discount after helping him get the Black Suns off his back. 2. Jek; childhood "friend" that now helps run a drinking establishment. Frequent source of underworld gossip. 3. Rhoza Feldan; Zabraki that has hired the twins twice before, always for interesting work. 1. Kaminoans; the twins' earliest memories of their family and home being wiped out by clone troopers and battle droids has soured their opinions of the race that created the clone army. Aspirations & Goals: Find someone to pass legacy on to, retire, maybe start school for girls like her. Quote: I am a product of years of warfare and martial superiority raised from childhood to be a superior soldier to all this other drivel, and yes. I am for hire. Personality: A confident and skilled mercenary, Cyrenia presents a stoic and ice cold demeanor to employers and those she doesn’t know, though to her few friends she is a sensitive if not exactly warm soul. Background: Cyrenia doesn’t remember much about her parents, nor does she care to. They were uninteresting people who became collateral damage of a hunt that her adoptive mother, Raina Jakita was on, taking note of the Cyrenia and her sister Liava, Raina in the interest of passing on her legacy and training she took them with her. Raised in a spartan lifestyle of hardship and tests, they were trained in hand to hand combat, marksmanship, tracking, navigation. Melee, technology, intimidation, persuasion and proper etiquette. Forging them into at the beginning passable soldiers. From there it was learning on the job, working with their mother as Apprentices before at 18 they were told to strike out on their own. Cyrenia found herself in the employ of the Red Star brotherhood, a mercenary company known for their one hundred percent success rate. An early stand out due to her training, Cyrenia did well with the brotherhood, who hired themselves out to the Empire, Black Suns and the Hutt cartels, her missions among the company weren’t particularly interesting, ranging from search and destroy to industrial sabotage and kidnapping but she enjoyed good pay and combat experience. 1. ARC-88 "Backblast" Blackbird CO and leader of the only trustworthy group of mercs she knows. Also something of a brother to her as he was trained by her mother. 2. Caiden and Raise Duenn. Initially meeting as enemies while the twins were assisting a friend with the Black Suns, a certain friendship has formed between the three over the period of a few missions. 1. Roan Lagin, a mid level Hutt enforcer with a grudge. Augments: Commlink installed in her skull, cardiac overclocker, lung enhancements, thermal detonator with deadman switch installed in chest, right arm cyberarm. Skills: At home on a ship and in space, some astronavigation training, skilled atmospheric pilot, passable hacker. Skilled in most forms of combat, infiltration techniques and small unit tactics, impeccable etiquette and style. Personal History: Both of Ki’ora’s parents were mercenaries who had successful careers and retired to Arkania’s high spires. Born into this highlife, Ki’ora’s blood still ran hot like her parents, initially she attempted to put this passion into something else, like her fascination with the bodies of creatures and got herself into the prestigious Carosite XII medical academy, before dropping out before receiving her doctorate, after her trust was officially released to her. Finding herself some retired stormtroopers and mercs to train her, she entered into a two year period of intensive training to get some recommendations. Luckily for her she got picked up by a mercenary unit called the Blackbirds. 8 years later, she’s a competent mercenary and a skilled combat medic, saying she’s learned more on the job than she ever did in a stuffy classroom and as a result is a decent interrogator.